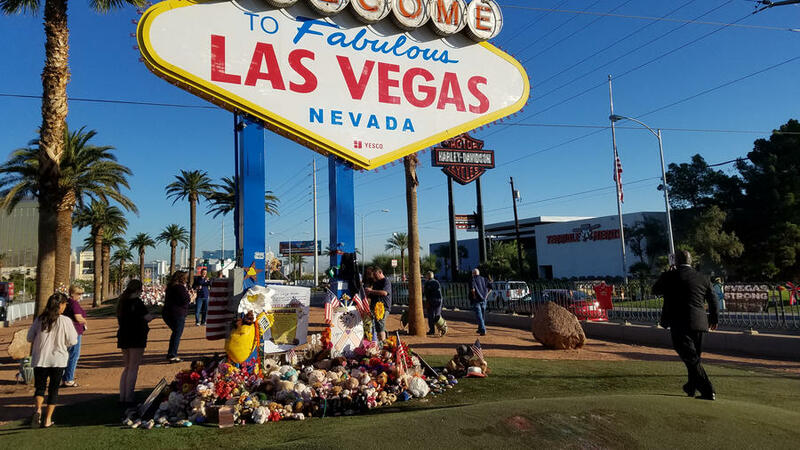 After the shooting, an impromptu memorial sprouted near the base of the iconic Welcome to Las Vegas sign. Although authorities have since pared it down, it originally stretched about 50 feet. It’s hard to believe it’s already been one month since the horrific shooting at the Route 91 country music festival in Las Vegas. For many, reminders of the tragedy still are very raw. An impromptu memorial to the victims still rings the base of the famous “Welcome to Las Vegas” sign, and 58 crosses commemorating those who died wind along a grassy knoll in the median of Las Vegas Boulevard. A green tarp on the fence that lines the western edge of the festival grounds still is riddled with bullet holes. The area still has 24-hour police presence. It remains a crime scene. At Mandalay Bay Resort and Casino, however, which the terrorist used as his perch, healing is in full effect. Upstairs, parent company MGM Resorts has replaced the windows the shooter broke on his rampage. Floors above, on the wing of the resort that faces the festival grounds, a banner reads: #VegasStrong. Downstairs, Mandalay employees put on brave faces to remember the tragedy but push forward with their lives. Bartenders speak solemnly about the fateful night and what they did to help. Table games dealers answer tourist questions patiently between hits and stays. Yes, the shooter was a guest just like you. No, I don’t remember dealing to him. Yes, everything is perfectly safe now. Perhaps nowhere on property is the recovery effort more obvious than in the restaurants. Food brings people together, and chefs, managers, and servers are bending over backwards to make patrons feel comfortable, safe, and welcome. Despite slower-than-usual business, the 15 restaurants at Mandalay Bay continue to crank out stellar food. The best way to support Vegas right now might just be to go and eat. Exhibit A: Della’s Kitchen, a farm-to-table breakfast-and-lunch restaurant inside the Delano Las Vegas, the resort’s all-suite tower. Here, Chef Jay Calimlim works magic with a gluten-free chicken confit hash that features Mary’s free-range chicken, two farm eggs, sweet potato, pearl onions, roasted tomato, and kale. If you prefer sweet breakfasts (and you can eat gluten), try the churro waffle with espresso mascarpone and fresh organic strawberries. Exhibit B: Border Grill, where chefs Mary Sue Milliken and Susan Feniger have attracted a cult following for their spin on Tex-Mex. Without question, the best deal here is weekend brunch; for less than $55 per person, you can choose from 10 different kinds of bottomless mimosas and an unlimited selection of made-to-order small plates that include chilaquiles, shrimp and grits, and skirt steak and eggs. Lunch at Mandalay Bay is serious business, too. Chef Hubert Keller’s Fleur is perhaps most famous for its $5,000 hamburger that comes with a bottle of 1995 Chateau Petrus 5000, but the grilled Spanish octopus with house-made chorizo, hearts of palm, baby heirloom tomatoes, and chimichurri sauce is just as good and costs a lot less. At RM Seafood, Chef Rick Moonen prides himself on his own interpretations of clam chowder (it’s white, but not creamy), and lobster rolls (they’re made with mayonnaise, Connecticut-style). For dinner, some of the best options include Shawn McClain’s Libertine Social, which debuted in August 2016 and is the property’s newest restaurant; and Aureole, a Charlie Palmer original that opened when the resort did in 1999. Perhaps the coolest food and beverage offering at Mandalay Bay right now doesn’t comprise food or beverages at all—it’s a bunch of books. As part of an ongoing art program in the lobby of Delano Las Vegas, MGM has partnered with French spirits group Remy Cointreau to bring in Collectif 1806, an exhibit featuring a series of antique cocktail books. The exhibit works much like an audio tour at art museums—signage in front of each book prompts you to call a number on your mobile phone, and an outgoing message on the other end tells you all about the book and its author. The oldest of the bunch is “The New and Improved Bartenders’ Manual,” which was written by Harry Johnson and dates back to 1900. Many bartenders and mixologists still refer to this guide today. “If you love books, love cocktails, or you just love history, this exhibit will speak to you,” said Emmanuel Cornet, Mandalay Bay’s vice president of food and beverage. As Las Vegas continues to recover from the deadliest shooting in American history, the more things that can speak to us, the better.